Have a rough day at work? Sick and tired of a meager middle-class existence? Up to your neck in political BS and just want to tell the world exactly how you feel? Why not spend a little down-time unleashing a new virus upon the world? 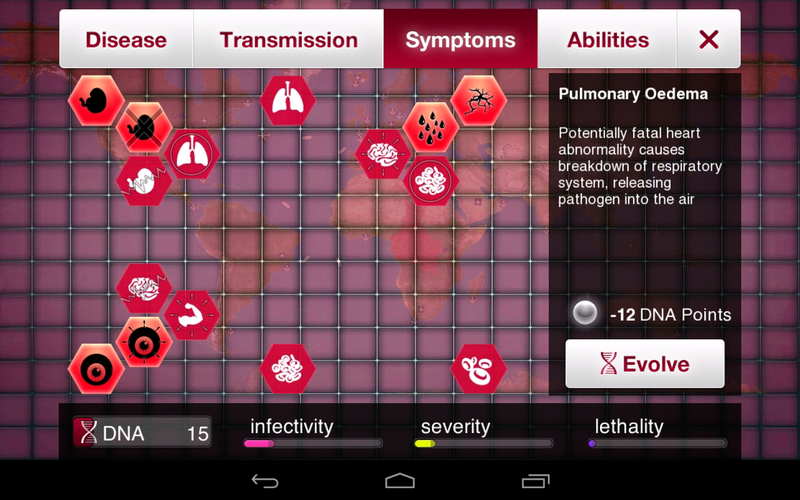 In Plague, Inc. you’re the virus and humanity is the enemy. 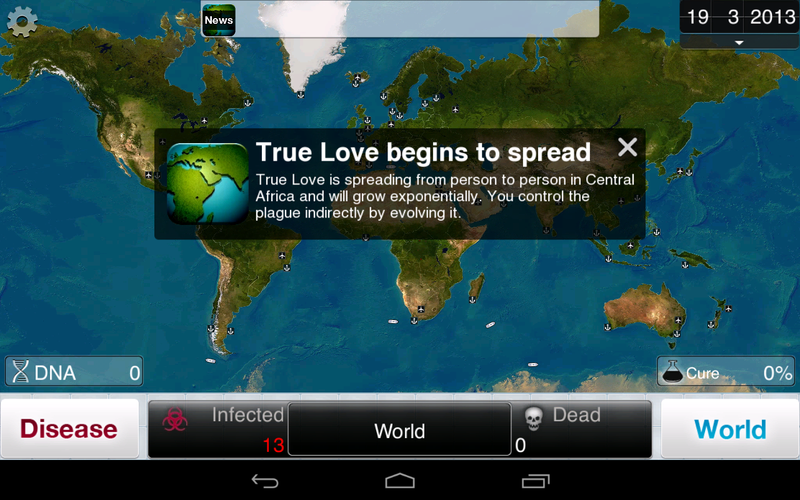 Give yourself a warm-and-fuzzy name (like True Love), evolve in creative ways to spread quickly and kill violently, and watch as the global population spirals down into a black pit of festering doom… I must admit, it does have a strange sort of appeal. In just 2hrs, you’ll feel refreshed and on top of your game once again! That is, assuming you can stave-off the cure. Pesky hoo-mans. 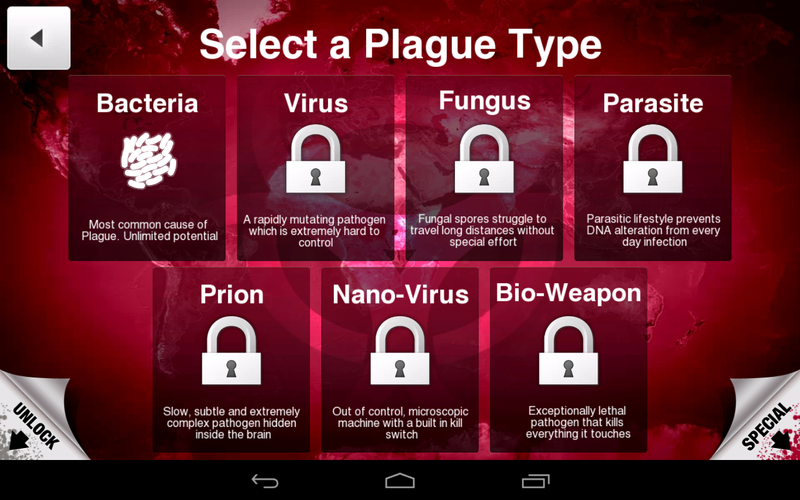 Plague, Inc. is one of those indie-style sleeper-hits that mostly flew under the radar on the Play store, and I was tickled-pink to have stumbled upon it whilst searching for strategy games. 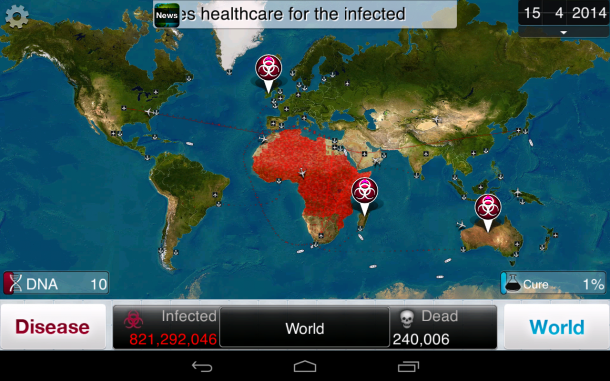 The goal of this game is to create a plague that’s so contagious, so nefarious, that you infect and kill the entire world-population before the global equivalent of the CDC creates a cure. Sounds easy, right? Ha. I have yet to actually be “victorious” despite having killed a hell of a lot of people. Once you choose your difficulty level and pick a name for yourself – hopefully something insidious or suitably ironic – you’ll insert your genes into the global ecosystem via your desired starting country. Each country has its own traits – urban/rural, arid/humid, hot/cold, rich/poor – so choose wisely. 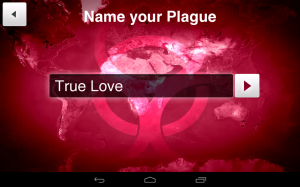 Your plague will begin somewhat resistant to your home country’s climate and therefore will more easily infect other countries sharing similar traits. 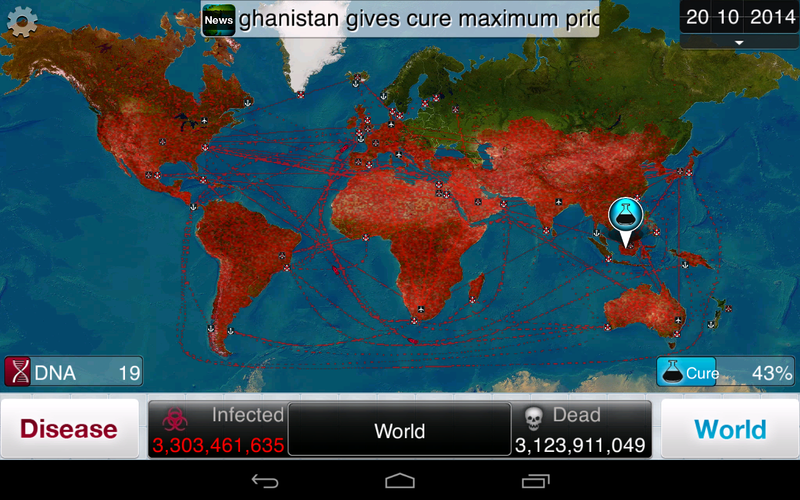 Furthermore, some countries have shipping ports and airports which you can use as channels to infect remote continents. 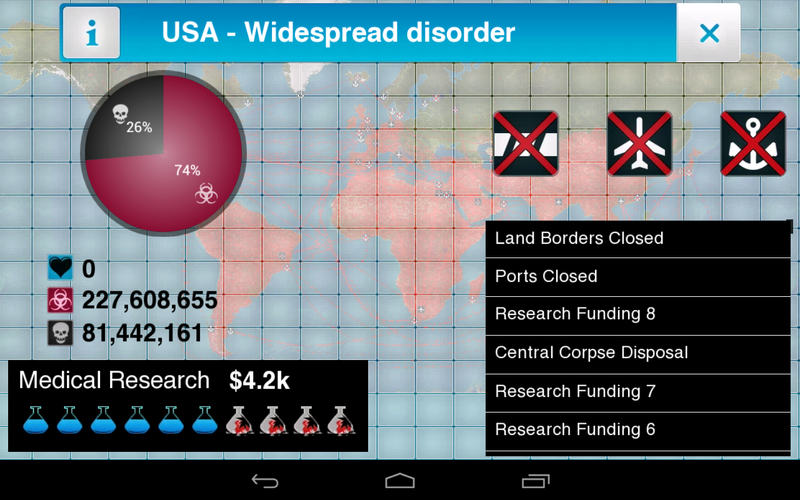 Your main interface for facilitating the spread of “ick” is a world map which serves as your information hub. 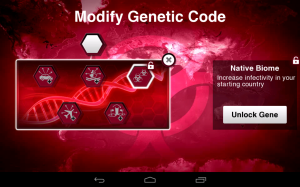 As your plague spreads, countries will grow increasingly red, chaos will ensue, and you will start accumulating DNA points. Furthermore, little bubbles (icons) will start appearing around the map representing the spread of your disease; tapping them will net you bonus DNA. 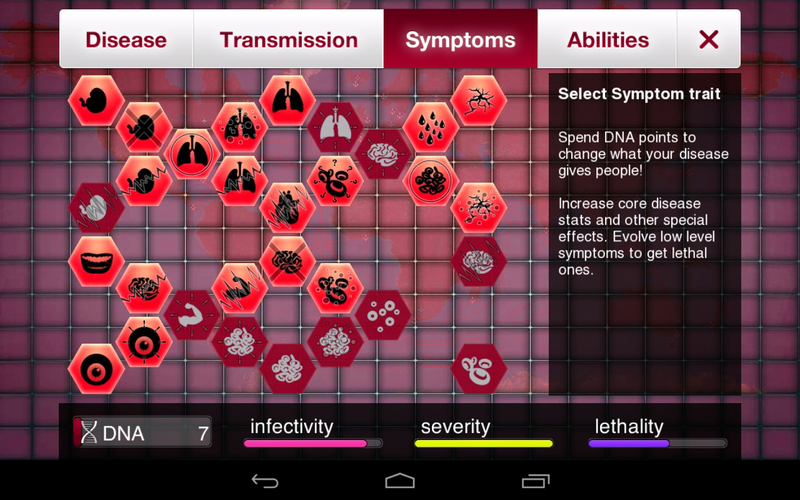 These DNA points are the life-blood of your disease, and you can spend them on evolving transmissibility (how your plague will spread itself), symptoms (some benign and some fatal), and abilities (resistances). Just keep in mind that the more lethal your disease, the more people will start to notice… and once countries are on to you, they’ll begin taking precautionary measures. 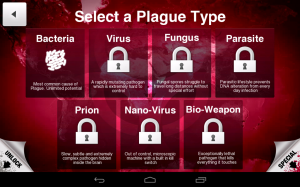 While your goal is the utter-destruction of the human race, the humans (obviously) would much rather destroy you – the plague that’s threatening their very existence. As your disease grows in power, countries will start shutting-down their airports and land-borders, restricting the movement of livestock, distributing face masks and bottled water, and contributing $$$ to research for the cure. Plague, Inc. is a constant race between your disease and the rest of the world, and you need to be quick on your feet. When a country implements a precautionary measure, details will briefly scroll across the “news feed” at the top of the screen and it’s up to you to decide how to respond. 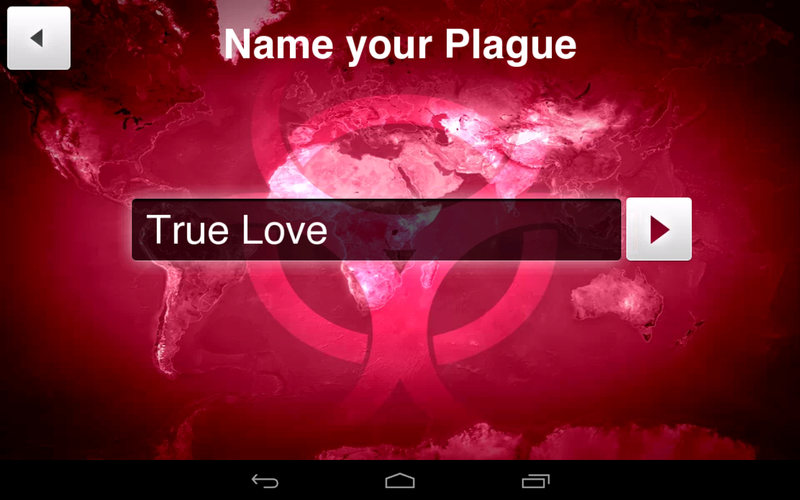 Only a wily and responsive plague will trump the survival-instinct of humanity. Luckily for you, should the majority of countries ban livestock, you can “devolve” the related abilities and put the points somewhere else. Genocide is a delicate dance, but lucky for you as your plague grows in strength so does the chance for spontaneous mutation (ie. new toys). Just keep in mind that once things get too lethal for the more wealthy continents (I.e. Europe and America), they’ll begin funneling huge amounts of cash into a global research project. It’s best to stay under the radar and spread like benign wildfire until it’s time to strike. Once the push for a cure gains enough momentum, your only choices will be delaying the inevitable via evolving resistances or becoming deadly enough that you kill the people trying to get in your way. 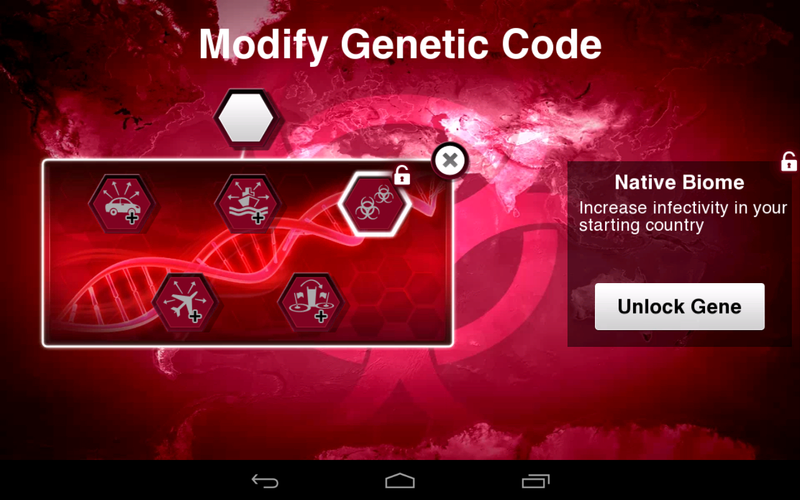 As you start putting notches-of-victory into your sadistic little belt, you’ll unlock new disease-variants and genome tweaks; all giving you new and more effective ways to obliterate mankind. 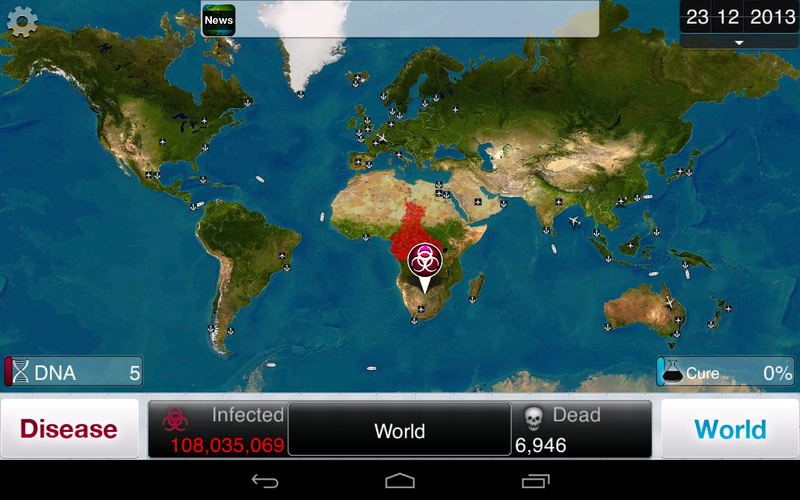 Plague, Inc. is a tough and engaging strategy game, albeit not terribly animated or graphically amazing. If you’re looking for a good couple hours of deep-thinking, this game will definitely give you a run for your money.